Carl Dixon’s show is a tour de force of music and stories from his incredible and lengthy music career! 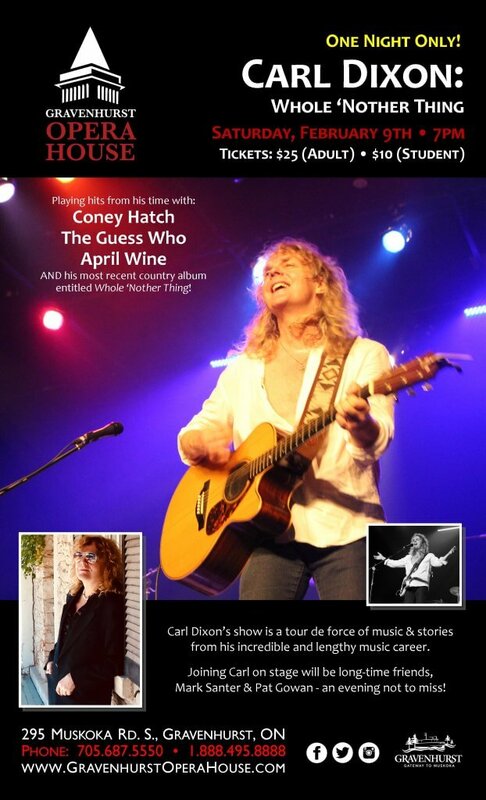 From his 80’s recordings with Coney Hatch, to his years fronting The Guess Who, playing with April Wine, then on to his most recent country album entitled, “Whole ‘Nother Thing“, Carl has a treasure trove of music and stories that will delight any audience. Carl’s singing and guitar playing are well known to music fans around the world, both solo and accompanied. Joining Carl on stage will be long-time friends, Mark Santer and Pat Gowan.